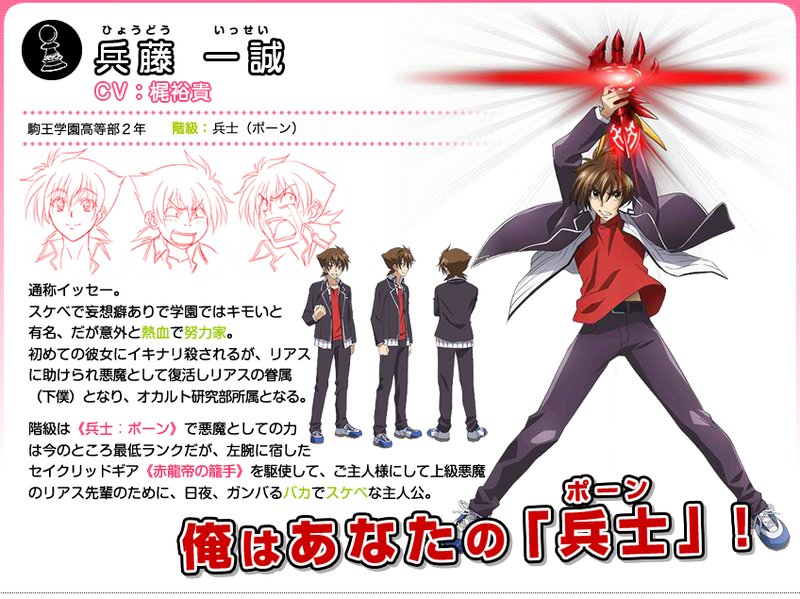 Issei Hyoudou is a character from the anime High School DxD. A second-year high school student attending Kuou Academy. He is known to be stupid, lecherous and a pervert among his peers. A normal high school student born in a normal family, but is in possession of the Sacred Gear "Boosted Gear" which is listed as one of the ultimate Sacred Gears (Longinus). He was killed by his first girlfriend, a Fallen Angel, and was revived as a Devil and a servant of Rias Gremory, his new master. Now he aims to become a Harem King by gaining a peerage, unaware of himself attracting girls around him. After Rias agrees to face Riser in a Rating Game with her engagement on the line, Issei and the rest of the Occult Research Club members go to a mountain to train. He later assisted Rias in her first-ever Rating Game against Riser, in which he assisted in defeating half of Riser's Peerage before going off to face Riser. Issei, however, was incapable of doing anything as his body has reached its limit due to the burden of the boosted power that is continuously placed on his body, and was nearly beaten to death by Riser, forcing Rias to resign. Waking up in his room and being informed of Rias' defeat by Grayfia, Issei becomes frustrated and blames himself for his weakness only to be given a paper with a magic circle engraved in it by Grayfia. Arriving in the engagement party hall, Rias' brother and Satan, Sirzechs Lucifer, reveals that he set up this event as an entertainment for Rias' engagement party, which allows Issei to battle Riser one more time in a one-on-one fight with Rias' engagement on the line, and won through the strategy he formulated beforehand. In Volume 3, Issei reencounters his childhood friend, Irina Shidou, who was under the Church's orders to retrieve the stolen Excalibur swords. He also found out about Yuuto's past and decided to help the latter to overcome his past. To that end, Issei, Koneko and Genshirou Saji went to find Irina and her partner Xenovia and made a temporary alliance with the Church duo, where they will help the two of them to retrieve the Excaliburs in return for allowing Yuuto to destroy them. They eventually encounter both Freed Sellzen and Valper Galilei, engaging in a battle with the two of them who manages to escape. Their alliance was then found out by their masters and the three of them are punished for taking this action without their consent. The Occult Research Club was then confronted by Fallen Angel leader Kokabiel who challenged the Gremory Team to a fight in Kuoh Academy. With backup from the Sitri Team who formed a barrier surrounding the school, the Gremory Team battled Kokabiel, Freed, and Valper. While the Gremory Team and Xenovia were able to defeat the Cerberus sent by Kokabiel and Freed who was wielding the fused Excalibur, they eventually engaged Kokabiel in a battle and were overwhelmed by the latter who revealed the death of the Biblical God. The Gremory Team, however, were saved by the sudden interference of Vali Lucifer, who came to retrieve Kokabiel and Freed under Azazel's orders. In Volume 4 Rias introduced her other Bishop, Gasper Vladi, to Issei, Asia, and Xenovia. Issei later helps in Gasper's training on how to use his Sacred Gear. Prior to the meeting of the Three Factions, while visiting Akeno at the shrine she used to stay at, he receives St. George's Dragon Slayer sword, Ascalon, from the Archangel Michael, and learned of Akeno's identity. He later assisted in fending off the Khaos Brigade members who came to kill the leaders of the Three Factions during the peace negotiations, as he and Rias go to rescue Gasper who was being used by the Khaos Brigade. After successfully rescuing Gasper from the Khaos Brigade, Issei, Rias, and Gasper are surprised at the sudden betrayal of Vali Lucifer who then goes on to fight Issei. Using the bracelet given to him by Azazel, which act as a substitute for the sacrifice needed to use the Scale Mail, he begins his duel with Vali. While initially incapable of doing much against Vali, Issei uses Ascalon to break Vali's shield and manages to transfer Ddraig's power to Vali's Scale Mail, forcing it to temporarily stop its function and land an attack on Vali. Issei, however, was shocked at the recovery rate of Vali's Scale Mail and with few options left, Issei decides to take a risk by implanting Albion's power to the Boosted Gear, which was successful and created the Dividing Gear. Vali, who was interested at the situation, goes on to say that he will halve all of Issei's surroundings, which Azazel adds on that breasts will be halved as well, angering Issei to the point that he is able to overwhelm Vali in his usual Balance Breaker form. The battle, however, was ended abruptly by the sudden intrusion of Bikou who came to retrieve Vali before he could activate his Juggernaut Drive. In Volume 5, he goes to the Underworld with Rias and his friends for the Young Devils Gathering. Upon arriving at the Gremory region, Issei, along with Rias and her peerage, is greeted by the servants of the Gremory household before meeting Rias' mother, Venelana Gremory, and nephew, Millicas Gremory. During that time, he was taught how to read and write the Devils' alphabet, proper table manners, dance classes and how to interact with people with high social status. Before the ceremony for the Young Devils Gathering, Issei meets the four other Devils that are chosen for the competition: Sairaorg Bael, Seekvaira Agares, Zephyrdor Glasya-Labolas, and Diodora Astaroth. 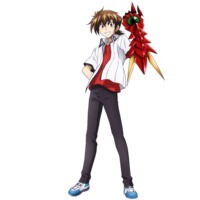 After the Rating Game between Rias and Sona was determined, he was forced to train with the former Dragon King, Tannin, in one of the mountains in the Gremory region, and obtained a great stamina that he can use when he gained his Balance Breaker. Issei, however, did not attain his Balance Breaker until the fight against Kuroka and Bikou where he gained full-access to his Balance Breaker after poking Rias' breasts. He then assisted Rias in her Rating Game against Sona. While he manages to defeat Saji, he lost due to blood loss which was set up as a plan by the Sitri Group to defeat Issei. Before disappearing however, Issei reveals his new move, Bilingual, which allows him to talk with female breasts and learnt of the Sitri Group's strategy, allowing Rias' team to win the match in the end. While the Occult Research Club is leaving the Underworld to head back to the human world, the group was surprised by the sudden appearance of Diodora Astaroth, a Devil whom Asia healed in the past, who came to propose to Asia. In Volume 6, Issei and his friends accompany Rias to the television station of the Underworld for an interview for the Young Devils Tournament where they met Sairaorg and his Queen, Kuisha Abaddon, who just finished their interview and told the Gremory Team that he wants to face them with pure power only. During Rias and Diodora's scheduled Rating Game, the match was interfered by the sudden appearance of the Khaos Brigade and the revelation of Diodora's alliance with them before kidnapping Asia. The Gremory Team would then go on to defeat Diodora and his peerage and rescue Asia until the sudden appearance of Shalba Beelzebub who sends Asia to the Dimensional Gap. This act caused Issei to activate the Juggernaut Drive of the Boosted Gear due to the negative feelings that appear after the apparent "death" of Asia and made him go berserk. He defeated Shalba but was incapable of stopping himself until Azazel and Sirzechs composed an Oppai Dragon song and used Rias' breasts as a switch to help him release the Juggernaut. Issei then witnessed the appearance of the Great Red, who was swimming in the Dimensional Gap. In Volume 7, Issei goes on a date with Akeno, which ends with both of them meeting Odin, Rossweisse, and Baraqiel, Akeno's father and Fallen Angel leader, who served as Odin's bodyguard at that time. The Occult Research Club is then attacked by Loki who came to kill Odin and create Ragnarok. Issei faces off against Loki in a fight but was dominated by the arrival of Fenrir. Issei and his friends are, however, saved by the timely arrival of Vali Lucifer and his team. The two teams eventually decided to work together to fend off Loki and Fenrir, asking the advice of the Dragon King, Midgardsormr, on how to defeat Loki and Fenrir. During the final battle against Loki, Issei wielded a replica version of Mjolnir, a hammer used by Norse God Thor. While initially incapable of fully using the Mjolnir, Issei gains the ability to use it after helping Akeno reveals her true feelings and make amends with her father through the help of the Chichigami (breast god), adding with the Holy Lightning of Baraqiel and Akeno and allowing them to defeat Loki.